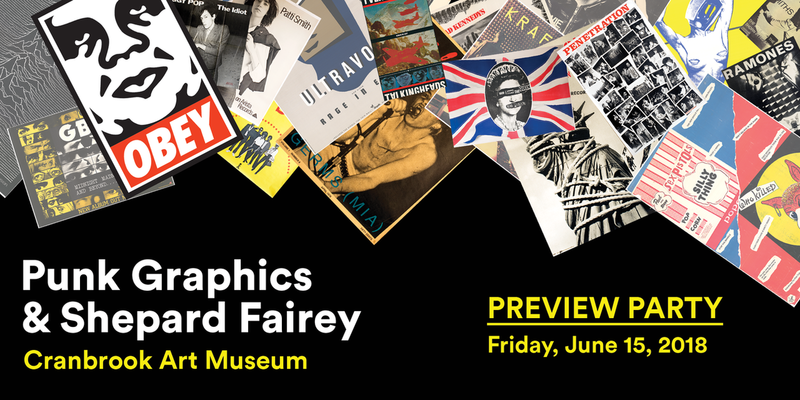 This summer Cranbrook Art Museum dives head-first into the depths of punk and post-punk culture with the debut of Too Fast to Live, Too Young to Die: Punk Graphics, 1976-1986 and Shepard Fairey: Salad Days, 1989-1999. Join us on Friday, June 15, for the exhibition preview and join Art Museum Director Andrew Blauvelt, artist Shepard Fairey, collector Andrew Krivine, and many more friends and fans to celebrate the opening of these two landmark exhibitions. Too Fast to Live, Too Young to Die: Punk Graphics, 1976-1986, examines one of the most important cultural movements of the twentieth century through the graphic design of its printed matter: the flyers, posters, vinyl packaging, and zines from the U.S. and the U.K. and beyond. Shepard Fairey: Salad Days, 1989-1999, considers the first decade of Fairey’s artistic practice, and its roots in the graphic language and philosophies of the punk scene. Music! Cash Bar! Complimentary Appetizers! Both events are free for ArtMembers. ArtMembers do not need to purchase tickets, simply check in at the ArtMembers desk the evening of the event. For more information about Cranbrook Art Museum visit www.cranbrookartmuseum.org.